Cause I’d Rather Be Dancing! DanceSouth has been instructing local dancers since 2011. In this short time, we have become known for our high standards and sincere dedication to the welfare and education of our students. DanceSouth’s staff has the knowledge and experience in dance as well as a love for our students. We specialize in a quality and enjoyable dance experience with guaranteed individual attention to all students- on all levels. As a studio, we strive to inspire both recreational and competitive dancers and commit to excellence as a whole. 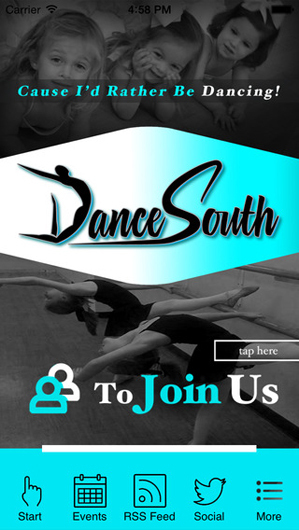 Keep up with Dance South on our DanceSouth App or follow us on Instagram and Facebook. Regular classes will not meet the week of May 13th. Dancers will attend studio rehearsals at their assigned time. Times will be announced in the recital packets given out during picture weekend. Dancers entering 1st grade-12th grade are welcome to audition for our company. Dates are May 21-23 and the fee is $50. Contact the studio for info. Parent’s should plan to attend a recital meeting for dancers in the “Cause I’d Rather Be Dancing” recital on Tuesday, April 23rd at 6:00pm. Please only send one person to the meeting due to limited space. Parents will attend a recital meeting/observation the week of April 15. This is for classes in the “Toon Town” recital. The meeting will be the last 30 minutes of class. Only ONE person per dancer will be allowed to attend due to limited space. We will have open registration for new students May 7-9, 2019 from 4:00-7:00pm. Registration fees are $40/dancer.